On the 4th of April 1780, American painter and minister Edward Hicks was born in Bucks County, Pennsylvania to Anglican parents, but was raised in the Quaker faith by one of his mother’s friends after she passed away when Hicks was still a baby. Trained as a coach painter, he later became a Quaker preacher. He tried his hand, albeit unsuccessfully, at farming to support his growing family, but found that he could cope better financially by painting. Quaker (Society of Friends) beliefs prohibited a lavish lifestyle, having excessive quantities of objects or materials. The religious evangelic movement were known for their refusal to participate in war or swear oaths; they also opposed slavery and teetotalism, and believed in plain dress. In search of economic opportunities and a more tolerant environment in which to build communities of “holy conversation,” some Friends from England emigrated to the Northeastern region of the United States in the early 1680s. Hicks grew up in such a community in Pennsylvania. In them, “Evil was represented by the wolf, the leopard, the bear, and the lion, each with an ancient element that extends to humans. The lion stands for the choleric element, fire; the leopard, the sanguine element, air; the wolf, the melancholic element, earth. Good found its allegory in the lamb, the kid, the cow, and the ox. According to Hicks’s interpretation of Isaiah’s prophecy, the lamb would “overcome” the wolf and lose its fear in peaceful reconciliation.” (Richard E. Ahlborn, review of Alice Ford’s Edward Hicks: His Life and Art in Winterthur Portfolio, Vol. 21, No. 4, Winter, 1986). Alice Ford suggests that we should accept Hicks’ Kingdoms and the farms as a moral allegory for mankind’s nature and its capacity for order and peace. Hicks preached through his paintings about the human quest for a redeemed soul, most likely inspired by his theological beliefs, one of them being the Inner Light, a fundamental Quaker doctrine. Its founder, George Fox, explained that along with scriptural knowledge, many individuals achieve salvation by yielding one’s self-will to the divine power of Christ and the “Christ within”, or “God in everyone” a concept taken from the Bible’s Colossians 1:27. 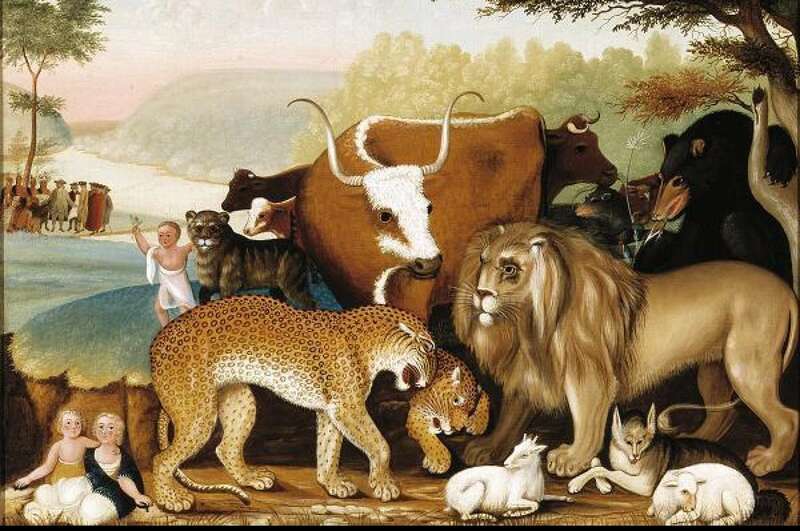 So the humans and animals in Hicks’ paintings coexist in harmony by possessing this blessing by reuniting all living beings in peace. In an essay about the art of Hicks, J. M. Vlach underlined the fact that Hicks’s painting was not given much justice while seen merely as belonging to the generalised category of American folk art. So, it is advisable to see the artist not only as an American, but as a Pennsylvania Quaker, “not as original, but derived, not as optimistic but anguished. The only qualities of folk tradition that can legitimately be claimed were in the artist, not the artworks. Too often the term “folk art” is used as a convenient umbrella under which many orphaned objects find shelter. Many do not really belong there, and paintings are a particularly glaring example. Almost forty years ago Clement Greenberg had the good sense to recognize that the category of folk painting was a contradictory term, at least in Western society: “After all, folk art hardly ever included pictures as such; not since Paleolithic times had European ‘folk’ used color and line for anything other than decoration.” (Clement Greenberg, ‘Primitive Painting,’ in Art and Culture: Critical Essays, 1961). “His main point was that the so-called American Primitives who seemed to flourish in the nineteenth century were tied to academic precedents via printed media, not to folkloristic traditions. This was certainly true of Hicks’s works, and although his use of academic sources was well known, it was blithely over-looked, and he continued to be hailed as “America’s foremost folk painter,” as if the facts did not matter.” (John Michael Vlach, ‘Quaker Tradition and the Paintings of Edward Hicks: A Strategy for the Study of Folk Art’, The Journal of American Folklore, Vol. 94, No. 372, Apr. – Jun., 1981). One needs to look at Hick’s work as much more than ornamental folk painting, done as a pleasurable pastime, and dig deeper, to find the man behind the art and the way his beliefs seep into its symbolism. Love learning so much about someone whose life and art are almost unknown to me! But fascinating in its themes. Thank you for posting this. Thank you for reading, Carol! Glad I found you! Loved the article. Wish I could find my distinct Quaker voice in my art. I realize perception and the experience of the world is a large part associated with my art and realizing that our link with the world is a physical one and can overshadow our spiritual link. Will become a regular visitor. He was quite controversial within the movement though? he actually led a split I think?